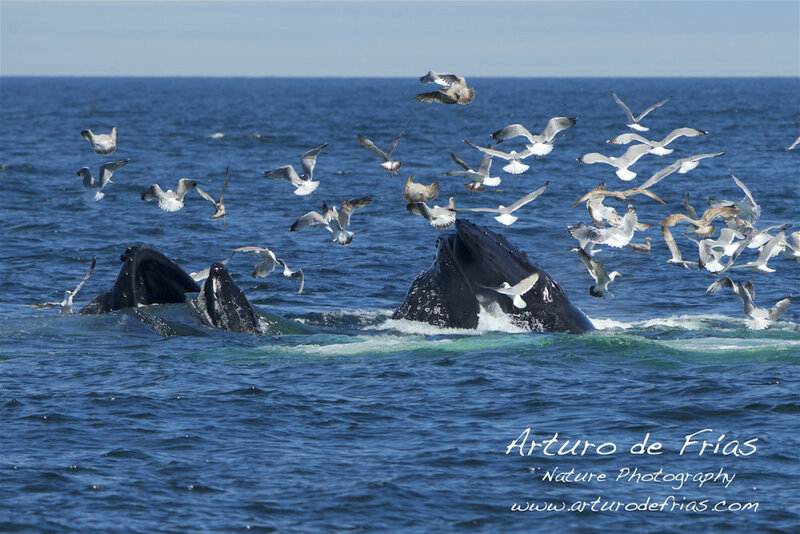 Two Humpback Whales (Balaenoptera novaeangliae) feeding, surrounded by gulls. The whales create a net of bubbles which traps the fish inside. They feed by swimming upwards with their mouths open and gulping huge amounts of water which they then expel, keeping the fish or plankton inside their mouths with their baleen plates, a sort of filter. Dos Yubartas o Ballenas Jorobadas (Balaenoptera novaeangliae) pescando. Las ballenas trabajan en equipo, creando una red circular de burbujas que al ascender atrapa a los peces en su interior. Luego solo tienen que subir nadando a la superficie, con las bocas abiertas, tragando una enorme bocanada de agua, que luego expulsan, manteniendo el pescado o plankton en su interior.